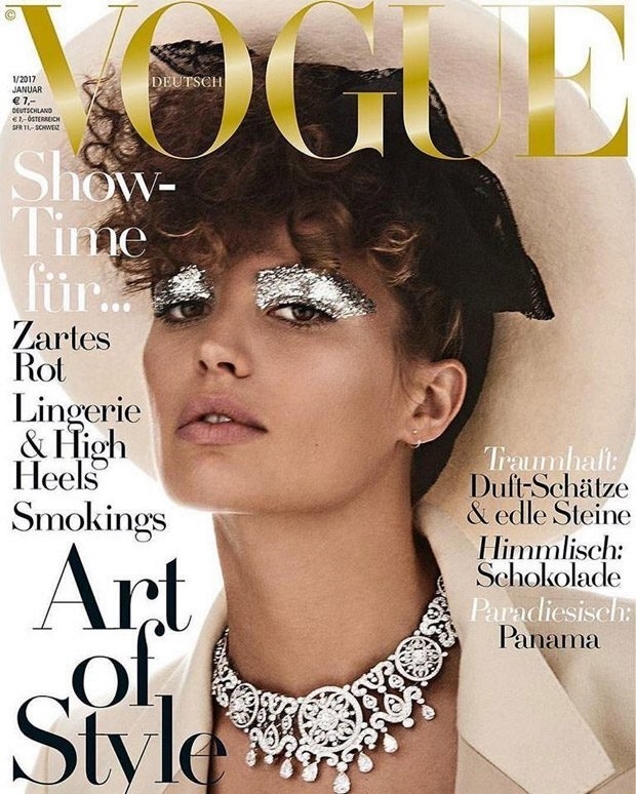 While the majority of our favorite fashion glossies tend to kick off the new year with a bang, Vogue Germany is off to a rocky start. The magazine hit a home run with its festive December cover featuring sisters Edie and Olympia Campbell and continues the festivities with a glitzy, stylized January cover. Continuing to choose models for its covers (which we applaud, BTW), Cameron Russell was photographed by Giampaolo Sgura for the occasion. Not all of our forum members were impressed, however. “Would be better for their December issue with all that bling/glitter/gold. But happy to see Cameron Russell,” DutchHomme commented the moment the cover struck. “Even though at first sight I found it garish and gaudy I think I’ll hold judgment until I see it in person. Something tells me it’ll look different in person,” A.D.C pointed out. “I like it, it’s the first time I’ve seen Cameron with her hair up, and she actually looks great here. And very mature. Apart from the fading masthead, this looks like a winner for me,” admired Benn98. “I hardly recognize Cameron here, but it’s a great cover! I love the metallic makeup,” sixtdaily confessed. “Not a fan, I barely recognized her!” exclaimed a horrified gossiping. Are you a fan? Add your own two cents and await the contents here.